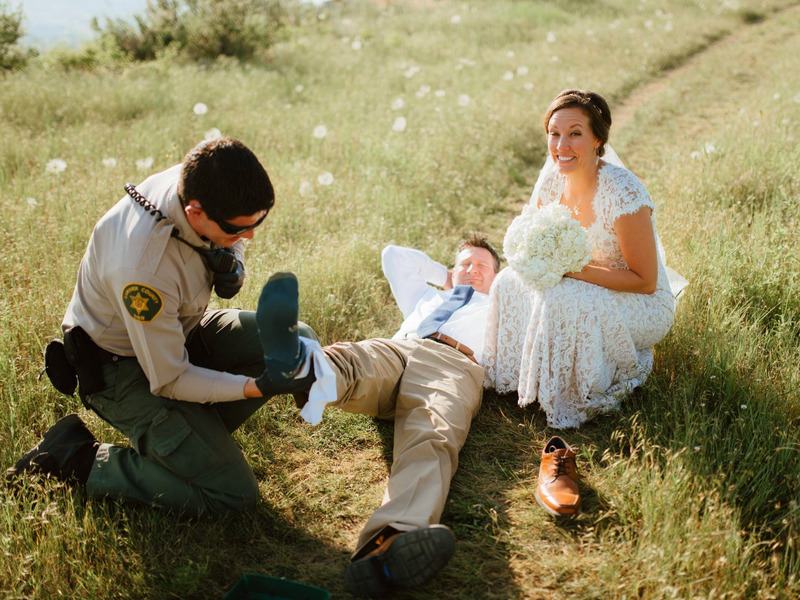 A Colorado couple just got an unpleasant wedding surprise: The groom was bitten by rattlesnake, right in the middle of a pre-reception photo shoot. Newlyweds Johnny Benson and Laura Loretz of Fort Collins, Colorado, were posing for photos when the snake slithered from the grass and bit the groom, the Coloradoan reports. Their photographer, Maddie Mae, captured the aftermath of the bite in a series of photos shared on Facebook yesterday. Benson was quickly transported by paramedics to a nearby hospital, where doctors could determine the severity of the bite. The ranger had warned that, if the snake injected venom into the groom, he might require several days’ hospitalisation. Luckily, ER staff found that the bite was venom-free — meaning Benson could leave immediately. The couple kept calm and smiled through the entire ordeal. And, incredibly, they arrived just one hour late to their wedding reception. See the all the images at photographer Maddie Mae’s Facebook page.